What does a slogan or tagline really mean? The common theme here is an invitation, prompt, or challenge for you to take some sort of action. It’s about getting you to think, taste, do, and leave. A vocabulary of verbs. But there’s nary a verb in the tagline of the Charro family of local restaurant concepts. In fact, it’s just one word, and as I noticed at dinner last night, it’s a word that weaves its way from the back of the house to the front. It’s positioned prominently on each employee’s shirt. It’s a unifying theme around which every team member rallies, and literally embodies, and it’s built on the profoundly simple promise of yes. This got me thinking as I was slurping fresh oysters from their shells at Charro Del Rey, the Flores Family’s newest concept downtown. I was surrounded by the pledge and the power of yes. To me, the very attitude that anchors the idea of yes is that there are no excuses. No obstacles. No nos. 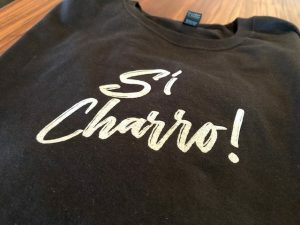 There isn’t a single thing that will stand in the way of delivering a memorable culinary and cocktail experience, and whether you’re at El Charro, Charro Steak, or Charro Del Rey, you’ll see yes in a whole new way. When a company’s culture is built on the promise of yes, and when yes defines who you are, the market will naturally respond with a community-wide chorus of Si.